In March 1925, an aviation branch was formed with four aircraft; the anniversary of this event continues to be celebrated annually as Mongolian Aviation Day. In 1988 the armed forces consisted of 24,500 active-duty personnel (21,000 army and 3,500 air force). The air force included 100 pilots and was organized into one fighter regiment, at least two transport squadrons, and a helicopter squadron. 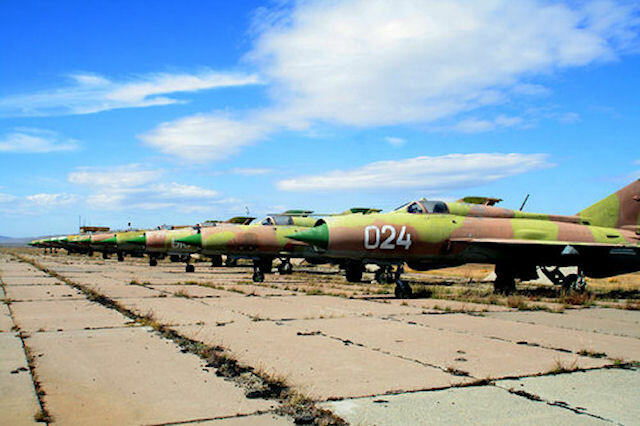 The air force was equipped with more than thirty Soviet MiG-21 fighters along with An-2 biplanes, An-24, An-26, and An-32 transports, and Mi-4 and Mi-8 helicopters. 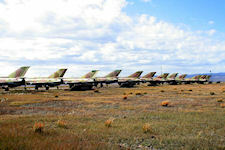 In the early 1980s the Air Force of the Mongolian People's Republic was believed to operate some ten MiG-21MFs and the same number of MiG-17s for ground attack. The Transport force totalled about 30 aircraft: An-2s, An-24s, and Il-14s. 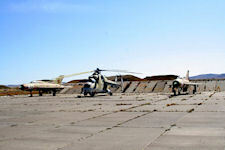 The helicopter squadron flew about a dozen Mi-4s and Mi-8s. Three PZL-104s are used in the utility role. 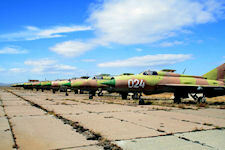 Training is on Yak-l1s, Yak-18s, and MiG-15UTIs. Zhugderdemidiyn Gurragcha, the first Mongolian to fly into space, was born on 05 December 1947, in the Gurvan-Bulak settlement of Bulgan Province, into the family of a cattle-breeder. He graduated from a military school of aircraft technicians in the Soviet Union. In 1972 he was enrolled at the Zhukovsky Air Force Academy. After graduating from the Academy, he worked as an aircraft equipment engineer in an air squadron of the Mongolian People's Army. In 1978, Jugderdemidiyn Gurragchaa started training at Gagarin cosmonauts' training center and completed a course of training under the Intercosmos program. His flight with Vladimir Dzhanibekov on Soyuz 39 as a Research Cosmonaut, launched 22 March 1981, lasted 7 days, 20 hours, 42 minutes, 3 seconds. He was later Deputy Chief of central board of defense, Chief of a scientific institute in Ulan Bator; and eventually Mongolian Sectretary of Defence. The Civil Air Transport Administration, responsible for Mongolian Airlines (MIAT), was thought to be affiliated with the air force. All airline pilots had military ranks, and they flew Soviet-built transport aircraft on crop dusting, forest and steppe fire patrol, and air ambulance missions. They also provided mail and passenger service on 38,400 kilometers of domestic routes as well as on international routes to Irkutsk and Beijing, the latter inaugurated in 1986. Reduction of the Mongolian Armed Forces started in 1988. The Air Force was reduced when 18 combat aircraft were excluded from the service. As of 1997, the general purpose troops of the armed forces comprised motor rifle brigades, artillery brigade, independent motor rifle battalion, independent combat aircraft unit and other combat and combat supply and service units. The Mongolian Armed Forces had in service 24 combat aircraft, 12 armed helicopters, 15 light, 19 middle, and 3 heavy transport aircraft. 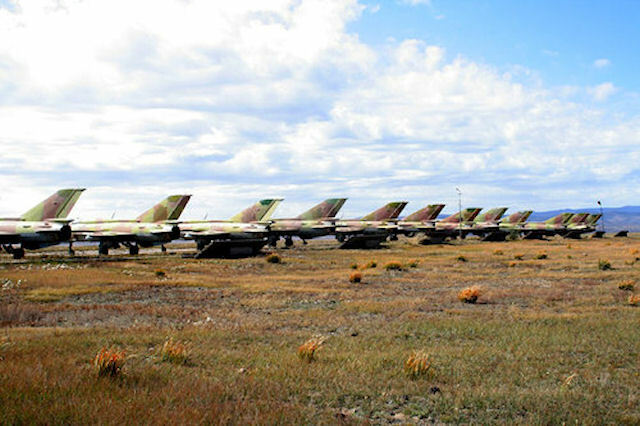 Due to a complete lack of resources, as of 2006 Mongolia did not anticipate being able to reform its flying Air Force in the foreseeable future. However, as air defense is part of the Air Force, the US was pursuing specific training line items in this field as well as air-related fields that may support peacekeeping deployments and operations (For example, slots to the US Army ADA officer basic course, tarmac security, and cargo loadplanning). 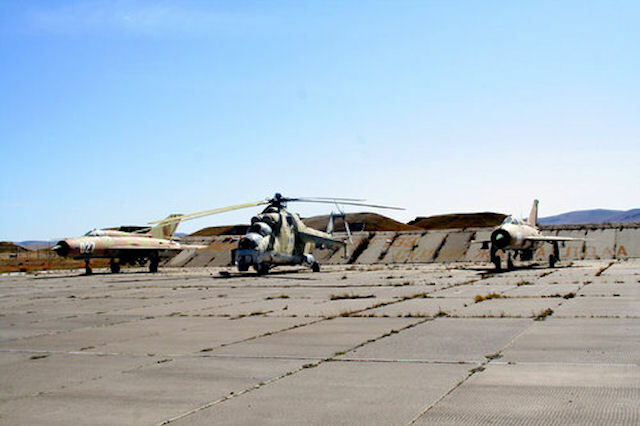 Russia's 2008 decision to provide to Mongolia around $120 million worth of conventional weapons and other military equipment, including MI-24 attack helicopters and possibly two MiG-29 fighter jets, has drawn renewed attention to the bilateral relationship. Although the terms of the deal were not initially clear, it would be a combination of grant aid and low-interest loans. The Mongolian Air Force's marking is yellow bordered red 5 point star bearing a yellow soyonbo (according a photo of a Mongolian fighter). The top of the soyonbo in the Air Force marking is not a flame, but a yellow 5-pointed star and two eyes and center line are not yellow but black. Soviet strategic defense was the responsibility of the PVO Strany (Anti-air Defense of the Country). In addition to the forces directly assigned to it, during the Cold War the Soviet PVO Strany could call on the services of the air defense elements of the Soviet general purpose forces. Moreover, each of the Eastern European countries of the Warsaw Pact had a separate national system equipped almost exclusively with Soviet materiel and organized in much the same manner as an Air Defense District [ADD]. For all practical purposes these systems constituted an extension of the Soviet system. During the mid-1960s the USSR assisted the People’s Republic of Mongolia in setting up an air defense system, which also was closely coordinated with the PVO. Today, in time of peace and war, the air defense forces are to safeguard the inviolability of air the frontiers of the country and to defend its economic and administrative centers and other vitally important regions from enemy attack.